Someone asked me this question recently at a conference in Mumbai. The answer to this question is very subjective, and really depends on the priorities and constraints of that person. For example, not everyone can afford to cut off their supply of monthly income by leaving their job and study full time. But the question of full time vs. part time MBA is not just about sacrificing monthly pay cheque. There are other factors to be considered, and so I thought why not list out a couple of advantages and constraints of each of these options. The decision still has to come from the person asking this question, but as I always say- making an informed decision is any day better than blindly following a trend or following someone's ready made suggestion. Part Time MBA classes are conducted usually in evenings and over the weekend. During that time, which is by the way limited, classes are slightly fast paced as compared to full time. Other than assignments, projects and completing the syllabus, these students do not get much bandwidth to get involved in student organizations and extracurricular activities. You might be thinking, so what? Extracurricular activities are not that important anyway- that's why they are tagged as 'extra'. Learning environment of a good management institute comprises more than just faculty and syllabus. In fact, student organizations form a very important part of the learning ecosystem at the campus. Students involved in these groups get opportunities to develop leadership skills, hone their communication skills, improve problem solving ability and develop group/ team management skills. Full time management courses offer this most important benefit to the students. Part time management course along with job adds third dimension to the much debated and delicately balanced work and home life. The pressure is not just to manage time for classes, but for completing assignments, projects and of course self study- all of which are integral to any management course. Good news is that these days many organizations which promote and support career development of their employees make provision for part time or flexible work timing arrangements. Management institutes like Jankidevi Bajaj Institute of Management Studies which offer part time diploma courses and Executive Mba part time in Mumbai mandate prior work experience as one of the eligibility criteria that offers one very nice benefit to its students- a ready-made professional network for life. On campus full time courses also offer networking opportunities, but of a different nature. Students get to attend various events within and outside the University. And time being on their side, they can join and actively get involved with industry associations like Bombay Management Association ( BMA ) or other collegiate meet-up groups to expand their network. Students of full time MBA get to apply the acquired knowledge and skills in the industry during internships or after completing their course when they get placed. Part time management students who are also working get to apply their class concepts in real time. What about students studying part time but not working. Do they get internship opportunities? Make it a point to clear that from the admission department of the shortlisted management colleges, because it depends on the institutes. 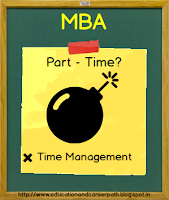 Not all MBA specializations may be available in part time format. In that case you can consider part time diploma courses. 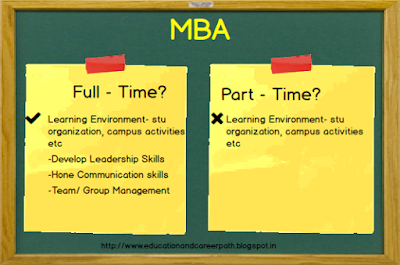 There are pros and cons of doing MBA full time versus part time. 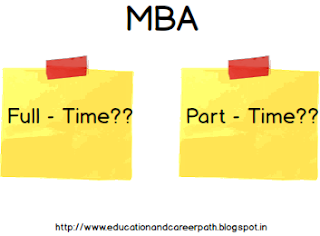 If the biggest advantage of part time MBA is that you don’t have to leave your job for your career development, then I think nothing beats the benefits of the rich learning environment and opportunities of overall personality development that full time MBA students get. After all, MBA is not a degree where only subject knowledge matters. Leadership qualities and effective communication skills are as important as the subject expertise in MBA. Article is giving really productive information to everyone. Well done. This is a very nice article analysing the factors that one should consider while choosing between full time and part time MBA program. Love the way it is written, clear and precise. Thank you for sharing this information. I am saving this article for my future reference. 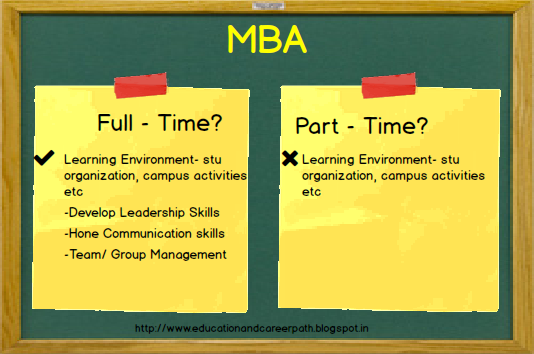 For more details about mba and pgdm difference visit ITM official website.